2016 has been a terrible year for so so many innocent people that had to flee away from their homes to escape one of the many war zones in the Middle East. Thousands of refugees dared to make the crossing on a rubber boat in the hope to find peace in Europe. The incredible brave ´Because We Carry´ foundation settled on the Greek Island of Lesvos to alleviate the ongoing human suffering of the people arriving. With a group of friends, we have decided to join ´Because We Carry´ by going to Lesbos and supplying them with a week of our assistance. Our main job is to supply the often exhausted people with breakfast and entertain the many kids that desperately need our love & attention. To be able to finance these meals we are aiming to collect at least 7000€, and that is where you come in!! 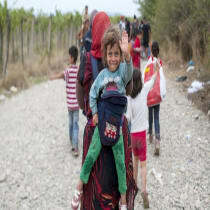 We will be heading off to Lesbos on the 15th of January and would be delighted to see your support (€€) come in (asap)! We have funded our own trip so every single euro you donate will go straight to those that need it the most! Skip one (very) nice evening out this month and instead help us help thousands of people with a week full of bananas & smiles! News from Lesbos will follow soon.